Too "Bizzy" To Check It Out Yourself? Thank Goodness For Bizzy! Life gets too busy sometimes. There, I said it. And it's true. Sometimes we get so lost in work and in other stuff that we rarely have time to focus on the less important things in life, such as finding good places to eat or shop at. We lead very hectic and "bizzy" schedules (I couldn't resist this pun, even though I've already used it in the title), that's why it's probably a good idea to get Bizzy so we don't stay out of the loop of good places that are worth a visit. 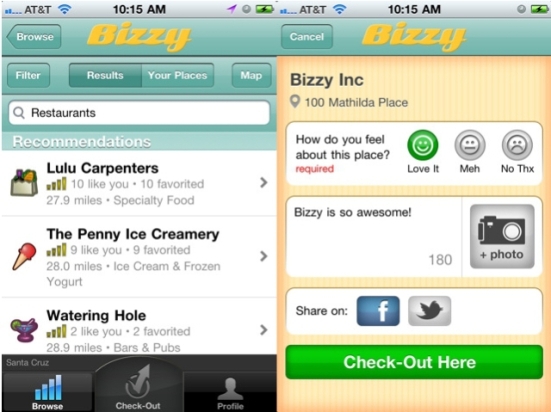 Bizzy is a free app that you download for your smartphone, be it an iPhone or an Android device. It's an app that gives you updated reviews on places to go and places to avoid for any place in the world. Just ate at a restaurant that served the worst food in the world? Then put up a review. Went to get your laundry at that place around the corner and received fantastic review? Then send more customers their way by putting in a good word for them. The thing with Bizzy is that it features reviews made by real people like you and me. The people behind the app know we're a busy bunch too, because it makes posting and reading reviews easy with its location-based Check Out feature. There are a lot of apps out there like Foursquare where you keep updating the places that you've been to. So why not do one up on that and actually let your network know how good the place was? Posting up a review is easy. Once you Check Out of the place, you simply fill out a short form to talk about the place. Did you love it? (Tap the smiley!) Did you find the place just blah? (Tap the straight-faced face!) Or did you just hate where you went to? (Then by all means, tap that sad face!) Type in a short review about the place and attach a photo, if you want to. Share it to your social networks on Facebook and Twitter and tap Check Out--and you're done. There's also a function on the Bizzy app which shows you a location map where you're based in. The map shows markers where people have left reviews so give it a quick once over if you're headed that way. The service is only available for residents of the United States though. But who knows? It might expand to your country sometime soon.